Sir! baka puwede ninyong ipanawagan sa buong mundo na magkaisa tayo at buhatin natin si Trillanes at ihagis na lang sa basurahan dahil wala na itong mabuting gagawin sa ating bansa kundi manira para lamang masunod ang kanilang hidden agenda.Hindi uunlad ang bansa natin habang meron mga ganitong tao hayok sa kapangyarihan. Padagdag naman please!Ganid sa pera!kanyo. Maka declare ba ako nang Rebolutionary government eh Canadian citizen ako ? Dapat mawala sa mundo ang katulad ni trollanes, nanggugulo lang siya sa Pilipinas, ikulong ulit yang naghahasik ng lagim. As what Pres. Duterte said.. God I hate drugs.....so I said..God help trillanes to think what is good for our country because everything he did and think now including the motives of his heart are all but revenge because of his hatred to our very own Pres. Duterte. I don't understand this people instead of helping our President. They are all against of it. The more they are against what the President is doing the more people are on the side of our President. Lets continue to pray for the safety and health of our President. Agree po sir for the good of our country. Kasuhan yan ng treason, nakakabweset na talaga tong sundalong kanin na eto grabeh. 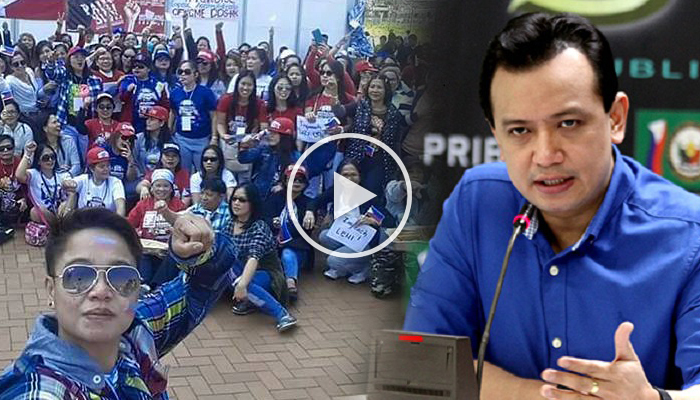 trillanes is the type of a person who needs a phsyciatric treatment... He's so convince on what he's doing is right 'coz no one get on his way and reprimand him... He is a dangerous man. The government must not ignore this type of species. They must be stop, terminated and remove from their posts and suspend all through out his working life to attain any govenment position. Otherwise, he can ruin a Country. Trillanes is an arrogant, discourteous, good-for-nothing politician who should still be made to serve his term in jail for leading the Oakwood Mutiny. Also, he should return what we taxpayers paid for his education. Seems like he was not educated at all. I firmly believe he is a disgrace to the Philippine Military Academy.